I first read The White Goddess during a road trip with my ex at the turn of the century. I can remember several days when we were staying at a bed-and-breakfast in pre-Katrina New Orleans. It was neither overly warm nor overly humid, and my erstwhile spouse was recovering from serving as a mosquito smorgasbord, so I had some down time to sit out on the patio and read. 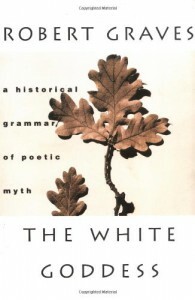 I have to say that the first time through this book left me confused and lost; the second time through I’m on firmer ground in understanding what Graves is trying to do with his “historical grammar of poetic myth” and I’m glad I have spent the last few months reading it again. Truly, you can read only the Forward and Chapter XXVI, “The Return of the Goddess,” and get the gist of Graves’ argument. What comes between is the convoluted path of erudition and intuition (and a certain amount of wish fulfillment on Graves’ part) where he explains the original purpose of poetry (myth) and its perversion. As Graves explains, poetic myth (the first poems) “are all grave records of ancient religious customs or events, and reliable enough as history once their language is understood and allowance has been made for errors in transcription, misunderstandings of obsolete ritual, and deliberate changes introduced for moral or political reasons.” (p. 13) Poetry originates as the invocation of the Triple Goddess (Aphrodite-Hera-Hekate are just one of her many iterations, she’s also the Muse who Homer calls upon in the Iliad) and the expression of the exaltation, horror and awe one feels in her presence. For millennia it was the religion of the Eastern Mediterranean and put out feelers throughout West Asia until it was perverted and eventually subsumed by invading patriarchal Sun worshippers (aka, Indo-Europeans and Semitic tribes) whose gods (Zeus, Apollo, Yahweh, etc.) usurped her attributes and – in the extreme case of Judaism and its descendants – denied the feminine principle entirely. This ur-religion persisted in a severely attenuated form in mystery cults (e.g., Eleusinian or Orphian), the bardic colleges of Ireland and Wales, and in witches’ covens before nearly vanishing utterly except in the intuitive inspirations of modern poets who don’t understand what it is they’re invoking. The book is a rather scathing indictment of Western civilization. Here’s the author’s description of the collapse of Western religion: “As a result, all but a very few have discarded their religious idealism, Roman Catholics as well as Protestants, and come to the private conclusion that money, though the root of all evil, is the sole practical means of expressing value or of determining social precedence; that science is the only accurate means of describing phenomena; and that a morality of common honesty is not relevant either to love, war, business or politics.” (p. 476) And he anticipates Stephen Prothero’s arguments in God Is Not One: The Eight Rival Religions That Run the World--and Why Their Differences Matter or Merlin Stone, there’s interesting information here. As I wrote, you can skip or skim Chapters I through XXV, without losing the author’s central message, which takes up all of 20 pages (in this edition). Á propos recommendations, three related texts readers might be interested in are the Prothero book referenced above, Derrick Jensen’s [b:Endgame, Vol. 1: The Problem of Civilization|60971|Endgame, Vol. 1 The Problem of Civilization|Derrick Jensen|http://d.gr-assets.com/books/1348664730s/60971.jpg|59299] (and vol. 2) and Thomas Mann’s [b:The Tables of the Law|6831877|The Tables of the Law|Thomas Mann|http://d.gr-assets.com/books/1328757281s/6831877.jpg|6884407] (which has a decidedly different take on the worth of the Law), and then there’s Graves’ own works: [b:King Jesus: A Novel|456386|King Jesus A Novel|Robert Graves|http://d.gr-assets.com/books/1312000469s/456386.jpg|1661521] and [b:The Greek Myths: Combined Edition|820461|The Greek Myths Combined Edition|Robert Graves|http://d.gr-assets.com/books/1347652599s/820461.jpg|50975].